Outbreaks of measles in several parts of the U.S. have been making headlines. 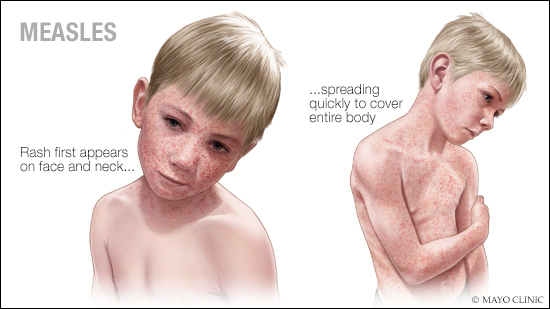 Measles is contagious, and can be serious and even fatal for small children. Once common, measles now almost always can be prevented with a vaccine. As a result of high vaccination rates, measles hasn't been widespread in the U.S. for more than a decade. While death rates have been falling worldwide as more children receive the measles vaccine, the disease still kills more than 100,000 people a year — most under age 5. Have you and your family been vaccinated? Omega-6 fatty acids are a type of polyunsaturated fat found in vegetable oils, nuts and seeds. When eaten in moderation and in place of the saturated fats found in meats and dairy products, omega-6 fatty acids can be good for your heart. Learn more from Dr. Francisco Lopez-Jimenez, a Mayo Clinic cardiologist. Cervical dysplasia is not cancer. The term indicates that abnormal cells were found on the surface of the cervix. Cervical dysplasia can range from mild to severe, depending on the appearance of the abnormal cells. Dysplasia could go away on its own. Or, rarely, it could develop into cancer. Learn more from Dr. Shannon Laughlin-Tommaso, a Mayo Clinic gynecologist. Are you thinking of trying a new exercise or ramping up your current fitness routine? If so, you may be at risk of an overuse injury, which ultimately could prevent you from being active. Overuse injury can happen when you take on too much physical activity too quickly. Learn how to safely increase your activity level and prevent this common exercise injury. Phenylalanine isn't a health concern for most people. However, for people who have the genetic disorder phenylketonuria, or PKU, or certain other health conditions, phenylalanine can be a serious health concern. Learn more from Katherine Zeratsky, a Mayo Clinic registered dietitian nutritionist.